John McLusky painted his first James Bond strip in 1958 for the Daily Express in England. He continued doing so until 1966 making 13 of the James Bond novels into comic strips that are sold even today in book form. 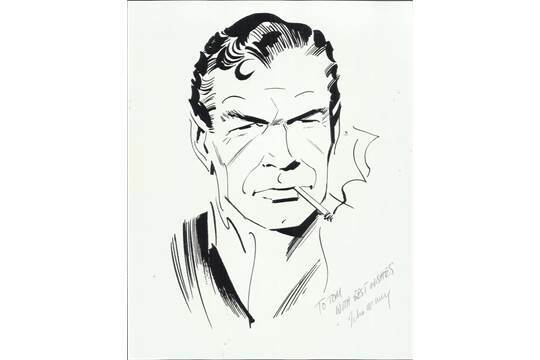 In 1982 John McLysky came back to draw for new James Bond adventures. It is said that the look of James Bond the way McLusky painted him later became the look Albert R Broccoli and Harry Saltzman were after which made them choose Sean Connery in the end to play James Bond. 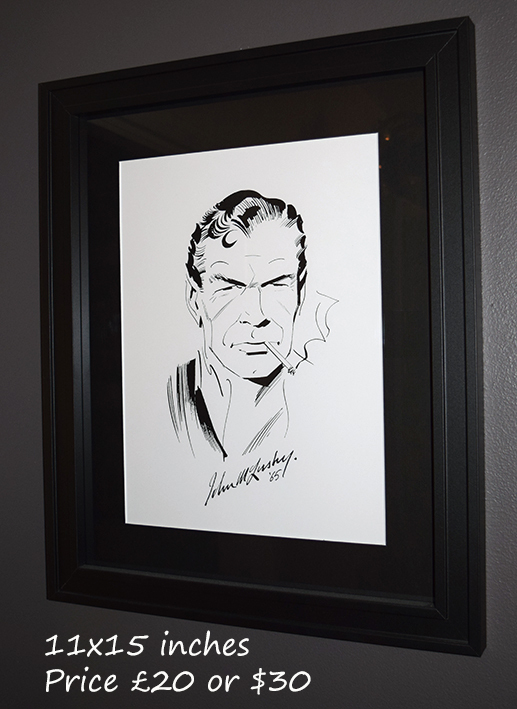 Up for auction now is a photograph of John McLuskys most famous James Bond drawing (copy) with an original signature. The autograph is made out to Tom so here is an extra chance if you happen to be named Tom. Estimated selling price is between £50-£80. The only wired thing is that Chaucer auctions fail to mention the size of the picture. Quite crucial I would say.You can find the auction here! I have a copy of this painting in my collection on my wall and it looks amazing. I also have copies for sale that measures 11x15 inches. My price is £20 or $30 and if you happen to be interested you can email me at stephan.backman(a)bredband.net. Frame is not included in the price.